America responded to Japan’s invasion of China in 1937 and to the many news reports of indis­crimi­nate bombing of Chinese civil­ian tar­gets by im­posing trade restric­tions on exports to Japan. Ini­tially a procla­ma­tion by Presi­dent Franklin D. Roose­velt on June 26, 1940, it morphed into an expres­sion of national moral out­rage when the U.S. Con­gress passed the Export Con­trol Act on this date in 1940. The act gave the presi­dent power to halt or cur­tail the export of mate­rials vital to U.S. defense and, more notably, limit the un­licensed export of cer­tain mate­rials to Japan. Invoking the act on July 5, Roose­velt sus­pended the sale of air­craft parts (air­craft sales were al­ready halted), chemi­cals, and stra­tegic mine­rals to Japan—an act that raised the level of ten­sion between the two nations. Toward the end of the month the govern­ment halted ship­ments of high-octane avia­tion fuel, lubri­cant, and pre­mium scrap metals such as iron and steel. Lacking natural resources, Japan was sorely pressed to con­tinue its aggres­sion against China (for in­stance, Japan was almost totally depend­ent on U.S. oil), much less expand its eco­nomic and mili­tary orbit around West­ern colo­nial holdings in its South­east Asia back­yard. Washing­ton ratcheted up its attempts to restrain Japa­nese expan­sionist poli­cies by embar­going machine tools and all iron and steel ship­ments. That prompted Japan on Octo­ber 7 to pro­test the expanding export ban as “an un­friendly act.” Japan’s frus­tra­tion over the mili­tary stale­mate in China and the cas­cading em­bar­goes—the British and the Dutch followed suit in banning trade between their South­east Asian colonies and Japan—pushed Tokyo in the oppo­site direc­tion that West­ern leaders wanted Japan to take. The only way for­ward, as Japa­nese leaders saw it, was for their mili­tary to seize con­trol of the resources of British Malaya and the Dutch East Indies (pre­sent-day Indo­n­esia). It was a gamble taken in steps, first by moving troops into French Indo­china—prompting West­ern nations to freeze Japa­nese assets in their coun­tries—then opening up sham nego­ti­a­tions in Washing­ton, D.C., in Novem­ber and Decem­ber 1941 after hard­line Army general Hideki Tōjō became prime minis­ter the pre­vious month. Mean­while, on Decem­ber 1, 1941, Emperor Hiro­hito gave his mili­tary per­mis­sion to attack Western interests on December 7 and 8. 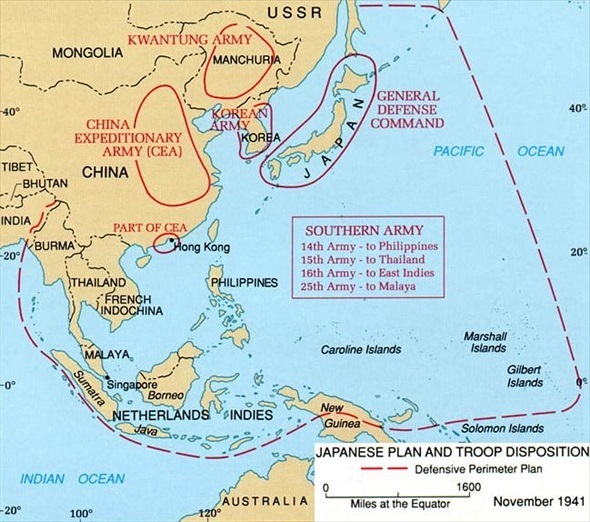 Above: Map showing Japanese plans for expanding into South­east Asia and Japa­nese troop dis­po­si­tions for defending their con­quests and the Home Islands, Novem­ber 1941. 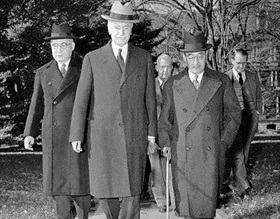 Left: Japanese Ambassador Adm. Kichisaburō Nomura and Special En­voy Saburō Kurusu (tipping hat) after speaking with Secre­tary of State Cor­dell Hull and Presi­dent Roose­velt at the White House, Novem­ber 27, 1941. Through much of the year, Nomura and Hull dis­cussed ways to resolve differ­ences over Japan’s terri­torial am­bi­tions in China and French Indo­china and the U.S. oil em­bargo. 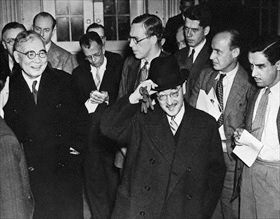 On Novem­ber 15, 1941, Nomura was joined by Kurusu. Kurusu presented FDR and Hull Japa­nese Prime Minis­ter Hideki Tōjō’s pro­po­sal that the U.S. cease pro­viding mili­tary sup­port to China and resume trade rela­tions that had been frozen in December 1939.